Below is a post I've copied from another FPF because it makes so many important points about the current direction City Hall Park is heading. It's easy to understand many of the influences that informed the current plan — the interests are valid, but the location of City Hall Park for their expression is wrong (more hardscape to host events) or they over-reach in the current plans (tree removal to sustain ecological welfare). Expanded paving will etch away the urban sanctuary we deserve while the long stretch of our paved pedestrian Church Street — infrastructure that could serve the same purpose and is likely to expand — is not mildly reformulated to address the need. The city has not successfully strategized a resolution to the causes of anti-social behavior by park users — social issues that have roots deeper than a new park design will address, and a prominent topic early in the redesign conversation. Wayne's comments below are to the point; thanks for considering them. What's Wrong with the Current Plan for City Hall Park? In a recent Front Porch Forum post a city employee cautioned you against what he called "misinformation" about the City's plans to re-do City Hall Park. Let me try to respond, and provide you some information -- not "misinformation." The City's current plan for City Hall Park would convert the Park into a version of New York City's Bryant Park -- a busy entertainment hub. This is a large part of what is causing the need to remove so many healthy trees -- and to substantially increase the amount of paved surface area in the Park. 1. Cutting down an additional 21 mature trees (only 4 of which are rated as in poor condition). It will take many years for new saplings to come close to maturity. 2. Substantially reducing the tree canopy and shaded areas to sit during hot sunny days. 3. Destroying the longstanding historic character and design of the park that's been in place for nearly 150 years, by relocating the pathways and eliminating the central water fountain -- replacing it with costly "water jet sprays." 4. Significantly increasing the amount of paved surface areas within the park to allow for the placement of the water jets and the increased performance space. Yes, there has been a long process in developing the proposed plan. But only relatively recently did the actual extent of tree loss and new paving become clear to many of us. Under pressure, the City administration agreed to form a small "ad hoc" committee this past Spring. 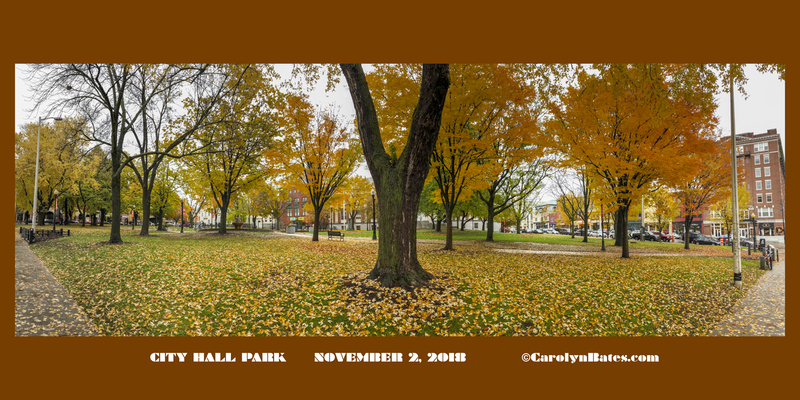 But unfortunately, the Mayor took a hard line approach during the committee meetings and refused to consider even minimal changes to the proposed park design that would save more than a handful of trees. For example, a number of healthy trees will be cut down because of a refusal to consider moving the proposed pathways just a few feet to avoid existing healthy trees. Sometimes getting things right takes some extra time. Some of you may remember that the City once planned a very costly "transportation center" for buses by the waterfront. The designs and planning process were very far along before there was enough of an outcry for the City to agree to rethink the process. The end result was a much better location, and, I believe, a lower price tag. So, yes, sometimes it takes an extra step -- especially when citizens get more familiar with the issues -- to do it right. I firmly believe that we can deal with the problems in City Hall Park -- problems primarily caused by a lack of proper maintenance over the years -- at a cost of much, much less than the $4 million that the City's current plan requires. This will still allow City Hall Park to continue serving as a focal point for civic events, but it will also maintain the Park's historic integrity; save many more of the Park's mature trees; and ensure that City Hall Park remains a vital green oasis in the middle of our downtown. I hope you'll consider signing a petition on Election Day requesting our City Council to place on the March ballot a resolution asking Burlington voters to advise the Council to reject the costly and poorly-conceived plan for City Hall Park.